Gunung Serapi is located in Kubah National Park and is near to the Matang wildlife sanctuary. 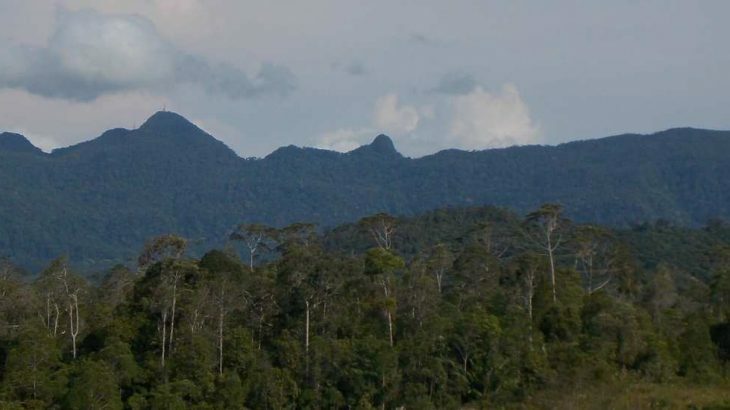 At 911m, it is the tallest peak in the Kuching area. It can easily be climbed in a single day, as most hikers complete the trek in 5 hours or less and it is a very popular jogging spot. The mountain is actually known as the Matang range, and Serapi is the highest peak of the range. Unfortunately, the true summit has an important telecommunications tower and compound on it, and access is restricted to military personnel or those working on the installation. Indeed, hikers who wander towards the summit will be turned back at a checkpoint about 100 metres below the true highpoint. Nevertheless, there is a really good viewing tower on a nearby top that makes the hike a worthwhile one. The trailhead is just 30 minutes from Kuching by car and there is a small car park next to the National Park ticket booth (110m). The trail up Serapi is essentially the access road all the way to the tower at the top! However, there are points of interest and numerous shelters to rest in on the way. The first landmark is the frog pound (285m) on the left, complete with boardwalk. It is thought that this pond was originally created by indigenous bearded pigs. After many centuries of being used by the pigs, the dip became deep enough that a pond formed. A recording made by an Australian of the frogs at dusk won ‘most beautiful sound in the world’ competition in 2014! Just after the frog pond is a junction (285m) with the Rayu trail (on the right). This leads down to the Matang Wildlife Centre (allow 3 hours) and would be a great, longer alternative descent route if you had a second car to pick you up at the other side and let the park staff know of your plans. A much shorter option is to go down the Rayu trail and then take the short Selang trail via the viewpoint at Bukit Selang back to Park HQ. A little further along the road to the summit is yet another junction on the right, this time with the waterfall trail. This is an extension to the main summit trail, as you have to come back the same way to the access road. Beyond this junction, the climb continues with regular resting huts at the side of the road (as often as every 100 metres). After an hour or so, the road flattens out a little and the vegetation becomes less dense on both sides of the road. Straight ahead is the shapely peak of Serapi with its telecommunications tower on top. After another ten minutes or so (under 2 hours in total from Park HQ for fit hikers) you will reach a large wooden building (785m) with a sign on the corner of it pointing to the ‘viewing tower’ which is 75 metres away to the right. Before the viewing tower you will go underneath a pulley system for sending items up and down from the telecommunications tower at the true summit. Just beyond this is another shelter (on the right) and pleasant view (on the left) of some of the lesser tops of the Matang range. The viewing tower itself is a wooden construction made in 1997 from Belian (ironwood) timber. It has several levels and a warning sign at the base. The sign states no more than 6 people should climb up at any one time and this seems like good advice. On the very top there are brilliant views to Gunung Santubong, the city of Kuching and nearby coastline and small islands. It looks like there is an obscure and rarely-used trail coming up from the other side of the compound next to the viewing tower, but it is unclear where this might lead. Strong hikers should be back down at the entrance in no more than 90 minutes. If you have more time in the area, there is another spot worth visiting. There is an old Hindu temple on the lower slopes of the mountain dating to the 1860s during which time tea plantations were to be found here (and Indian plantation workers who used the shrine). It was forgotten for decades when the tea plantation closed in the early twentieth century but ‘rediscovered’ in 1967 and subsequently restored. Ask at Park HQ for directions. Getting there: This mountain is easy to reach from Kuching by taxi or even bicycle. Accommodation: There are many hotels to suit all budgets in nearby Kuching. There is also National Park accommodation at the trailhead but you need to reserve well in advance on weekends. Permits: The entry fee is RM10 for Malaysians and RM20 for foreigners. In 2018, it is open from 8am until 5pm. You must remember to sign in and out. Water sources: Occasional sources by the side of the road but be sure to take enough bottled water with you. Had a great couple of days in Sarawak earlier this month, exploring two smaller peaks not too far from Kuching. First up was this one, Serapi. 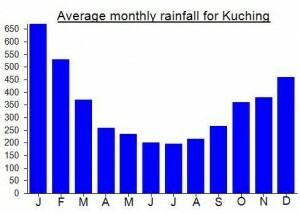 It;s a lovely range, clearly visible from Kuching airport and many parts of the city. Obviously it’s a real shame not to be able to bag it (unless you get a job working on the telcom tower at the top) but having this spot so close to a large city is fantastic. In clear weather the views from the top of the viewing tower are well worth it. No wonder it is a popular weekend spot for joggers. That said, we were the only two at the viewing tower – so perhaps a lot just go halfway up or do a smaller loop. We were up in 2 hours and down in less than that. The day after we hiked here there was a running race – 3 times up and down from the entrance. Would be interested to know what the name ‘Serapi’ means and where it comes from…..